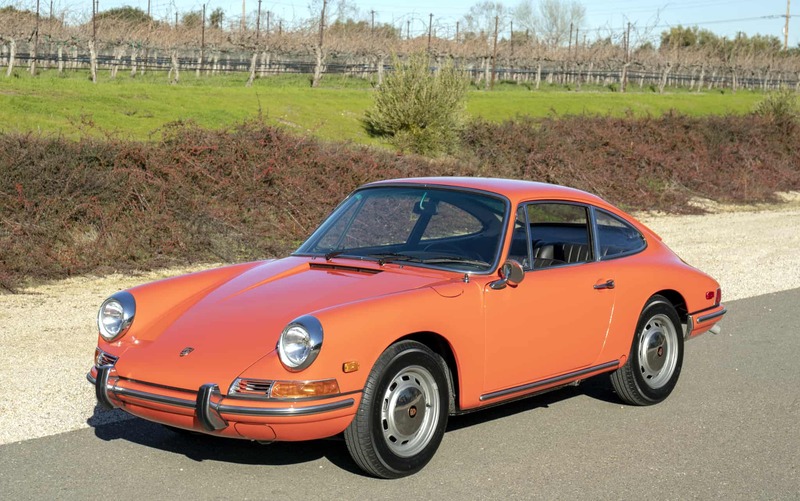 1968 Porsche 912 Karmann Coupe: One-owner; low original miles; no accidents ever; rare Tangerine 6809 factory color; numbers-matching engine and transmission per COA specifications; fully-restored. Body was disassembled and taken to metal (windows out); all panels were hand-blocked prior to paint; high-quality paint cut and buffed; re-assembled with all new body seals; undercarriage taken to metal and sealed with epoxy primer. New Black Leatherette interior done to factory specifications; new headliner; new factory-correct carpet. Original engine completely rebuilt with new pistons, polished crank, new rod and main bearings, cylinder heads professinoally redone, new engine seals; new exhaust; new clutch; new tires… Too many details to list. All this work was just completed in our shop. We specialize in restoring 356 and early 911 models, this is the first 912 we have completed to this extent. We go to extents to document our cars in pictures and provide the most transparent listings on Ebay. Please study the pictures carefully rather than requesting descriptions. Please complete any inspections or ask any questions prior to bidding or committing to buy the car. Thanks for the interest!